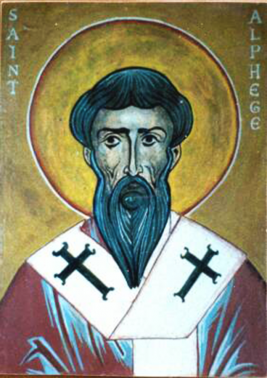 ÆLFHEAH, (ELPHEGE, ALPHEGE), St. Ælfheah was the founding-Abbot of an unnamed monastery at Bath. In 984, he succeeded St. Æthelwold (1st August) as Bishop of Winchester, and in 1006 he was consecrated thirtieth Archbishop of Canterbury. St. Ælfheah was murdered by the Danes (circa 1012) during a drunken feast because he would not ransom himself at the expense of his poor tenants, and was therefore regarded as a martyr, the only orthodox Archbishop of Canterbury to have been martyred. His relics were enshrined in St. Paul’s in London and later in Canterbury. CRESCENTIUS, a sub-deacon and disciple of the first Bishop of Florence (Italy), St. Zenobius (25th May), and student of St. Ambrose of Milan (7th December). St. Crescentius reposed circa 396. GEROLD, a member of the ducal family of Saxony (Germany) who donated his land to the Abbey of Our Lady of the Hermits of Einsiedeln (Abtai Einsiedeln) in Switzerland where his two sons, Cuno and Ulric, were monks. Following the example of St. Meinrad (21st January) the founder of Einsiedeln, St. Gerold became a hermit in the Tyrol, under the obedience of the Abbot of Einsiedeln. St. Gerold reposed in 978. URSMAR, Abbot-Bishop of the Abbey of St. Peter of Lobbes (abbaye Saint-Pierre de Lobbes — Hainaut, Belgium), and spiritual father of St. Dodo (1st October). St. Ursmar also assisted in the founding of abbeys at Aulne and Wallers-en-Fagne in Hainaut (Belgium). St. Ursmar reposed in 713. VINCENT of COLLIOURE, martyred at Collioure in Languedoc (present-day Occitanie in southern France) circa 304, during the Diocletianic Persecution.